The Lowell, long the New York hotel of choice for “in the know” world travelers, is poised to become even more sought-after in late Summer 2016 with a new restaurant and bar, library lounge, and garden in addition to updates to the lobby and Pembroke Room. Established as a luxury hotel since 1927 and privately owned, The Lowell remains one of the few properties where guests feel the welcome of home every time they check in. The beautiful landmarked hotel on East 63rd Street, between Madison and Park Avenues, is a short stroll from New York City’s best shopping and just blocks from Central Park. Situated alongside the most exclusive addresses on the Upper East Side, The Lowell is the picture of classic New York elegance. Sixty percent of the hotel is dedicated to spacious suites, furnished with the comforts of a stylish pied-à-terre; luxurious terraces, kitchens, wood-burning fireplaces, and concierge services to cater one’s every whim. Overseeing this unique hotel is Heiko Kuenstle, who returns home to The Lowell as General Manager after a ten year hiatus. With more than 20 years of luxury hotel experience, Heiko is uniquely suited to manage this redesign. “We have listened to our guests and assembled a distinguished team to realize their wish for spaces to relax and socialize while maintaining the refined feel and character of our hidden gem,” says Heiko. The legendary restaurateur Charles Masson brings his attention to detail and passion for hospitality to the hotel’s restaurant and bar. The restaurant idea and concept began as a casual conversation and has since evolved into the cornerstone of the renovation. For Charles, dining goes beyond great food; everything from the lighting and fabrics to the bouquets of flowers are paramount in creating an unforgettable experience for his guests. Chef Christian Delouvrier’s contemporary French-based cuisine with Mediterranean influences will complement Charles’ vision in creating the memorable dining room for which he is known. The much-anticipated restaurant, bar, and lounge will have an adjoining garden area featuring a fireplace, fountain, and large glass skylight to create a year-round indoor/outdoor dining experience. Charles’ passion for flowers and gardening will be reflected with lush flora throughout the interiors, and artful planting on the outdoor garden terrace. Designer Michael Smith, known for his modernist takes on traditional design, was tasked with refashioning the hotel’s guest rooms in recent years. Now he brings his discerning taste and innovative style to The Lowell’s lobby areas, restaurant, bar, and Pembroke Room ushering in a new era of enduring luxury to the hotel. Mark Pinney, the London-based architect for the project, is known for his work at Harrods and with leading international brands such as Armani, Burberry, and Apple. An intricate part of his design was creating the aesthetic link between the first and second floor public spaces to seamlessly connect the lobby, the library lounge, Restaurant, Bar and Pembroke Room, a favorite Upper East Side destination for afternoon tea. Dina brings her quintessential New York style and personal touches, including her exclusive line of bath and body products DDC28, to round out the hotel’s offerings which include 24-hour room service, up-to-the-minute technology, and in-house fitness and business centers. A member of The Leading Hotels of the World, The Lowell is known for its discreet service and high-profile clientele from around the world. Rates start at $960 per night. 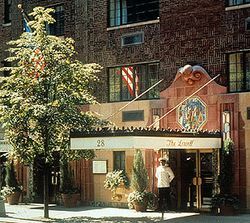 The Lowell is located at 28 East 63rd Street, New York NY 10065. For more information, visit the hotel’s website http://www.lowellhotel.com or http://www.lhw.com.